Regular readers will remember parts one and two of our ongoing series about amazing art from ordinary objects, so get ready for a new batch featuring everything from Cell phone sculptures to push pin portraits. Recently a number of readers have written in to submit their own works or works they have constructed from everyday materials. 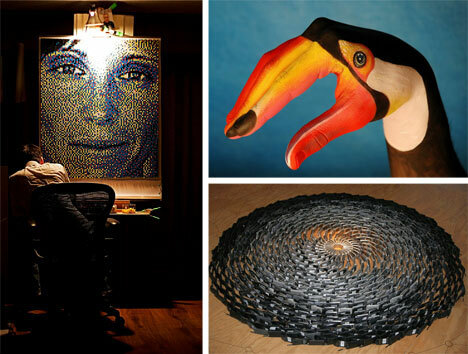 Guido Daniele is an accomplished painter who transforms ordinary individual hands into art, Robert Pettit has assembled some strangely inspiring art from discarded cellular phones and Eric Daigh has created some rich and complex works from a simple push pins. 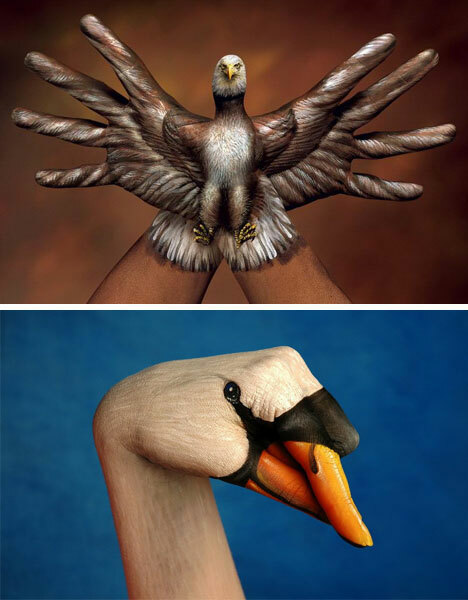 Guido Daniele‘s art ranges from gigantic murals to minutely detailed hand painting. This Italian-born artist started out as a sculptor but now primarily focuses on painting and illustration. 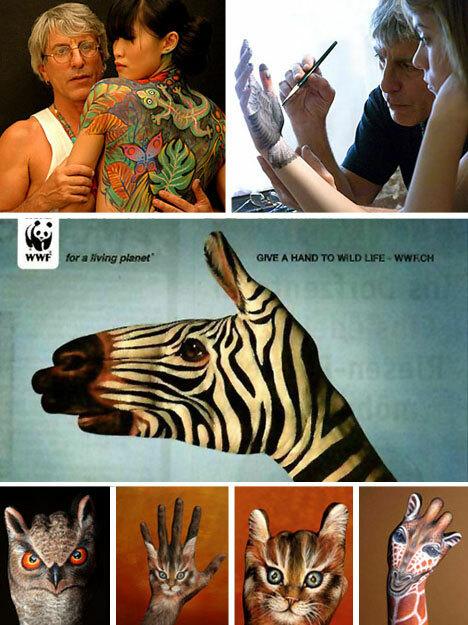 His designs have been used to create advertisements as well as to raise global awareness about environmental and other social justice issues. 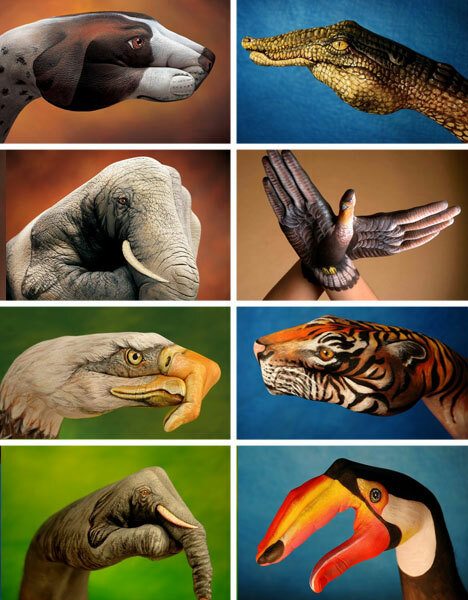 He is perhaps most famous for his body painting works which range from full coverings to small pieces, often with a purpose (commercial or good-cause) and often stunningly realistic. We all know that cell phones these days can call, text, surf the web and remind you to pick up your dry cleaning … but they can also be used for artistic purposes to create drawings, floor sculptures, light and sound installations and more. 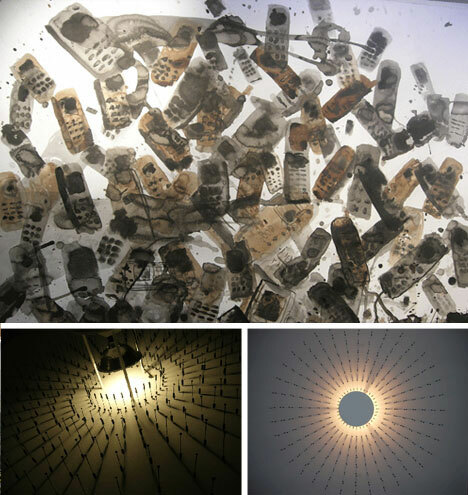 Artist Robert Pettit has a show up at the SMFA in Boston featuring these and other creative uses of over 5,000 cellular phones he collected for artistic purposes. 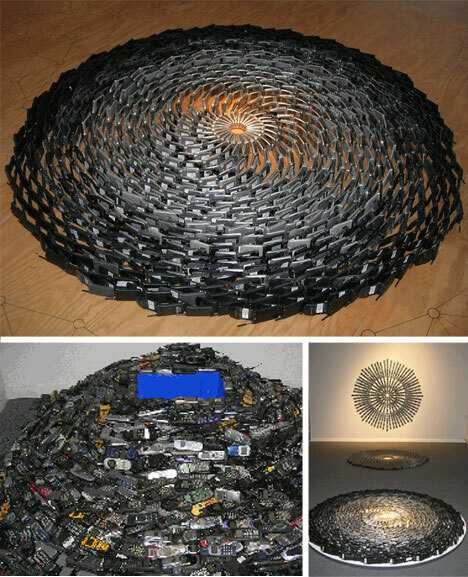 As more and more cell phones fall by the wayside each and every day, scrapped for the latest model, one has to wonder if there are other things (artistic and otherwise) that these strangely ubiquitous objects could be used for. Push pins are pretty unlikely candidates for an artist’s toolbox but have become a staple for Eric Daigh. Originally from Southern California Eric now works and displays his art in Northern Michigan. As most artists know sometimes limitations in terms of materials and color palette can be assets. Given the simple (and fairly bold) range of colors available for this type of tack work the range of results is impressive. 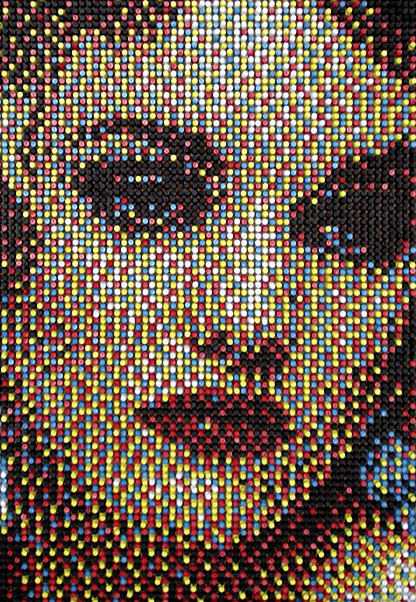 His process is just like a printing press sorting out valves in blue, red, black and yellow and the finished pieces involve 10,000+ pins. 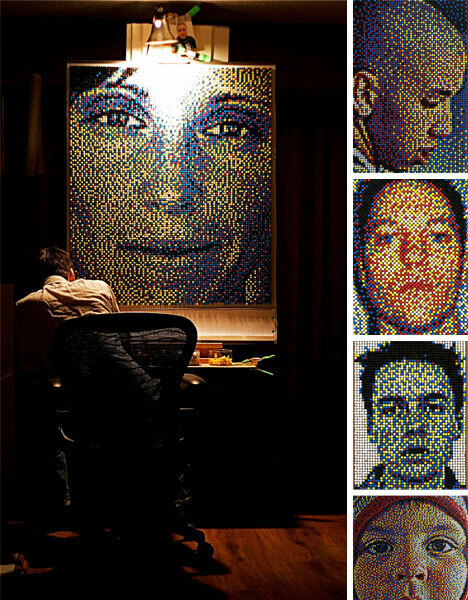 Eric’s talent is his eye, and his technique is better defined as color, not push pins. 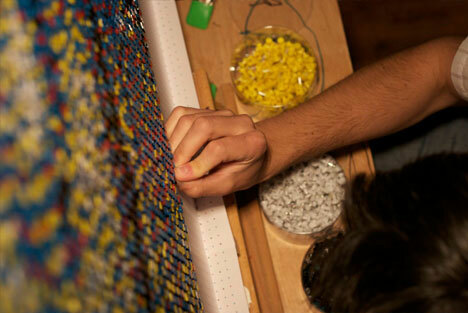 He intends to leave the pins behind when he finishes his current piece and begin a series in (what else?) torn pieces of colored duct tape. “It could be anything, really.” he says, “colored thread even.” Well, that’s true, it could be anything.